Linda Wervey Vitamvas is a ceramic sculptor working mainly in porcelain. Her relationship with Lynden began in 2010, when she and Kevin Giese presented the first Inside/Outside exhibition at Lynden. Indigenous Transience, her outdoor installation, an I-beam topped with many small bowls (and the occasional bird) made from local clay, has been a popular fixture since it was unveiled in the summer of 2010. Wervey Vitamvas returned to Lynden frequently: to document the installation as it was exposed to the elements and seasons; to add new pots and the occasional ceramic bird when we offered bird walks; to experiment with other materials on the grounds. 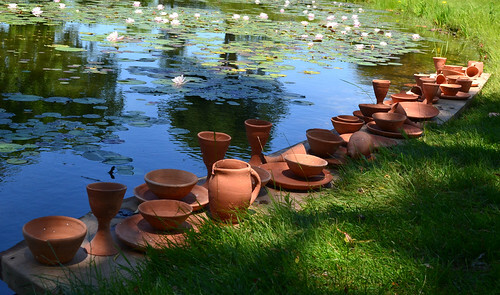 In 2011 she installed a sequence of tiny pots made of algae harvested from the small pond. They lined the shore and quickly became a part of the environment, arousing the curiosity of deer and ducks. They slowly disappeared: into the pond, blown by the wind, dissolved by rain. Three years later, we’ve formalized these occasional visits and experiments into a residency focused on ceramics. The first official event, on Saturday, July 6, is a farewell to Indigenous Transience—Wervey Vitamvas will be giving away all the bowls to visitors that day—and the unveiling of her latest site-specific work, Feast. Over the course of the residency year, look for further experiments with Feast and the introduction of ceramics workshops. Since the temporary installation of Indigenous Transience in 2010 I have been exploring the paradoxes of ceramic art through the use of locally dug clay and other natural materials. While traditional ceramic art is impervious to the elements, this new work begs to return to its original state. Elements of fantasy and childhood play contrast with decay and destruction. I think of this work as emanating from my alter ego: unlike the porcelain objects I make, it’s messy and earthy. It is neither “precious” nor permanent nor collectable. Craft and technique are intentionally denied. Feast—the series of experiments I am undertaking during this residency--is many things that traditional ceramics is not. Last year I collected more local clay and over the winter I began to make simple plates, bowls, and goblets. I paid little attention to detail and craft. The clay was not processed in any way and had many impurities and much organic matter in it. When low-fired, these bits burned out leaving white specks. Even in my studio, these irregularities began to cause the “finished” pieces to crack and fall apart. 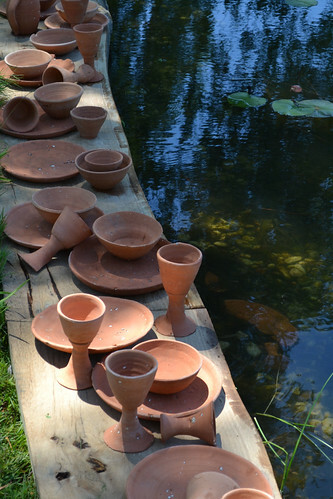 My first plan was to install the pots so as to suggest a dinner party that had been abandoned long ago. Visitors would discover it in the underbrush like an archeological site. I left my pieces half buried in the side of a small hill by the ravine, and when I returned to reassess a few weeks later, they were so lost in the rapidly growing underbrush that I could barely find them. I abandoned that experiment and instead asked friend and former Inside/Outside partner Kevin Giese to install planks of oak that he had carefully shaped to fit the curve of the shoreline of the pond. It is now a floating Feast. Linda Wervey Vitamvas earned her B.S. in Nursing from the University of Wisconsin-Milwaukee and practiced psychiatric, obstetrical and surgical nursing before returning to UWM for her M.F.A. Vitamvas has won awards in the 2009 Wisconsin Biennial, Forward: A Survey of Wisconsin Art Now, and the 2005 and 2010 Kohler Eight Counties exhibitions. Her work has been featured in the 2010 Wisconsin Triennial at the Madison Museum of Contemporary Art and in solo exhibitions at the Museum of Wisconsin Art in West Bend and at the Wisconsin Academy’s James Watrous Gallery in Madison. She has also exhibited at the Milwaukee Art Museum and the Villa Terrace Decorative Art Museum as well as in ceramic arts exhibitions nationally.